After going five and a half years without a raise, half a dozen people come up to me almost every day and ask when we're gonna get a contract. It's not entirely up to me, actually. But the NY Times today says de Blasio's people are trying to work out a nine-year contract with us, and perhaps in thus doing to set a pattern for the other unions, most of whom are one contract ahead of us. It's just talk now, of course. But if we set a pattern that's crap, there's always the off-chance other union members will come burn our houses down and stuff. And there is, of course, the 4 plus 4 pattern other unions got, which is very tough to justify not getting. It seems to me that if the UFT did not get that, other unions could argue there was no more pattern, and the next time some union accepts less than nothing, we and other unions could say sorry, but there's no pattern and we want more than nothing. Blogger Chaz sheds light on the loose talk I've been hearing about service credit in lieu of retroactive pay. And Juan Gonzalez says the city can afford to pay us, that there is a will, and there is a way. The Times article indicates that PERB is waiting on a deal. I can't remember how long I've been hearing that PERB will issue a recommendation any minute. So will UFT teachers get a little more money, so when our children complain we can mend their tattered little shoes? Let's hope. 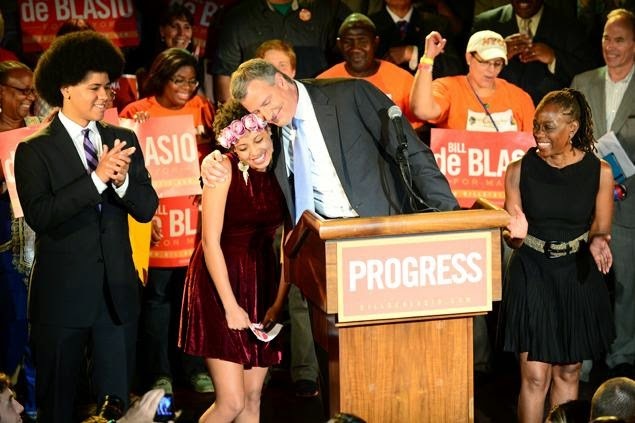 Bill de Blasio's in a funny place, with Moskowitz millions vilifying him at every turn for the unforgivable offense of keeping a few campaign promises. Doubtless the tabloids will be up in arms vilifying the profligate lifestyles of teachers if we commit the sin of earning an extra dime for our work. I'm on a road trip today, and I'm sitting in a Dunkin Donuts somewhere outside of Albany writing this. But even though I'm driving a Prius, the price of gas is pretty high. It would be great if the city would show it values public school teachers. Personally, I'd like to see Mayor de Blasio take a tough stance, telling the world that he supports not only public schools, but also those of us who teach 94% of the children in NYC, and 97% of the children in NY State. One of the egregious errors David Dinkins made after giving us a 5% raise one year was hemming and hawing rather than standing up and saying, "I support our teachers." That year, he turned his back on us. At the Labor Day parade that year, we wore black t-shirts that said "Shame on City Hall" on the back, and planned to turn our backs on him when we passed him. Mayor Dinkins surely knew what was coming, and ran off to a tennis match. Dinkins, who had won election over Rudy Giuliani by a whisper, lost the next election to Rudy by another whisper. We then sat through 20 years of abuse and corporate nonsense that was most certainly not beneficial to schoolchildren. I'll stand with Mayor de Blasio. If I were him, I'd make it a point to stand with the United Federation of Teachers, and all our brother and sister unionists as well.